Overall, 68% of the public favors increasing federal funding for research on wind, solar and hydrogen energy technology while 26% are opposed. 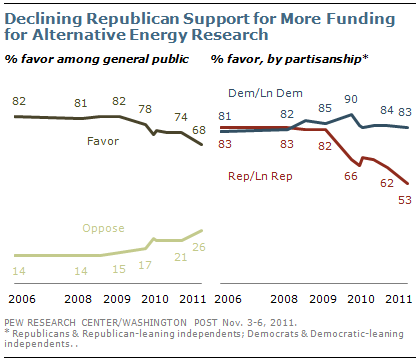 From 2006 through early 2009, roughly 80% supported increased federal funding for alternative energy research. The latest national survey by the Pew Research Center for the People & the Press and The Washington Post, conducted Nov. 3-6 among 1,005 adults, finds that a narrow majority of the public (52%) thinks that government investment is necessary to develop new energy technology. About four-in-ten (39%) say that businesses will produce needed energy technology without government support. On this measure there also is a large partisan divide. 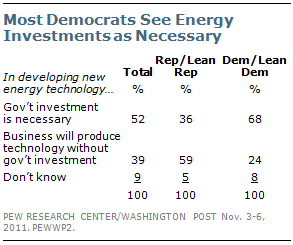 Two-thirds (68%) of Democrats and Democratic leaners say government investment in new energy is necessary. Most Republicans and GOP leaners (59%) say businesses will produce technology without government investment. Overall, somewhat fewer now say that government investment is needed for the development of new energy technology than did so in April 2009. At that time, 58% viewed government investment as necessary and 32% said businesses were able to produce needed technology without government investment. Support for increased offshore drilling is little changed from March, but has increased since last year’s oil spill in the Gulf of Mexico. In June 2o1o, before the spill was contained, only 44% favored more offshore drilling. Slightly fewer Americans favor increased offshore drilling today than did so a few months before the Gulf spill (63% in February 2010). 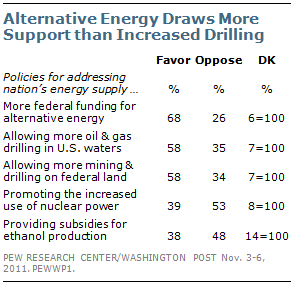 More Americans continue to oppose (53%) than favor (39%) promoting the increased use of nuclear power. Support for increased use of nuclear power has not recovered following the nuclear disaster at Japan’s Fukushima nuclear power plant. Opinion about increased nuclear power had been divided prior to the Japan disaster. (For more, see “Opposition to Nuclear Power Rises Amid Japanese Crisis,” March 21, 2011). Only about four-in-ten (38%) favor government subsidies for ethanol production as a policy for addressing the U.S. energy supply. Nearly half (48%) oppose ethanol subsidies. Nearly eight-in-ten Republicans and Republican leaners (78%) favor allowing more mining and drilling on federally owned land; just 46% of Democrats and Democratic leaners support this policy. 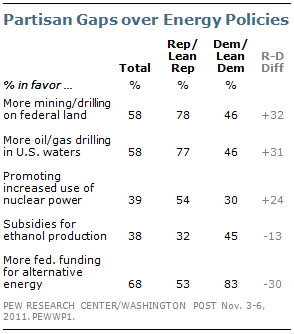 The partisan gap is as wide in views of allowing more offshore oil and gas drilling (31 points). In addition, more Republicans (54%) than Democrats (30%) favor promoting the increased use of nuclear power. More Democrats and Democratic leaners than Republicans and Republican leaners favor promoting federal subsidies for ethanol production (45% vs. 32%). And Democrats are far more likely than Republicans to support increased federal funding for alternative energy research (83% vs. 53%). 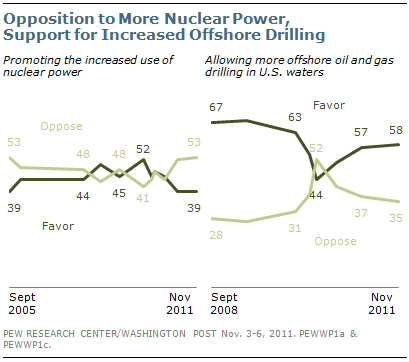 In contrast to the gap over alternative energy, the partisan differences over more offshore drilling and increased use of nuclear power date back several years. In April 2009, 86% of Republicans and GOP leaners favored increased offshore oil and gas drilling, compared with 57% of Democrats and Democratic leaners. In addition, 59% of Republicans favored greater use of nuclear power compared with just 38% of Democrats.